European infrared astronomy satellite. Infrared astrophysics. Astronomy, Infra-Red satellite built by Aerospatiale (prime), DASA (payload) for ESA, Europe. Launched 1995. AKA: Infrared Space Observatory. Status: Operational 1995. First Launch: 1995-11-17. Last Launch: 1995-11-17. Number: 1 . Gross mass: 2,500 kg (5,500 lb). The Infrared Space Observatory (ISO) is designed to provide detailed infrared properties of selected Galactic and extragalactic sources. The sensitivity of the telescopic system is about one thousand times superior to that of the Infrared Astronomical Satellite (IRAS), since the ISO telescope enables integration of infrared flux from a source for several hours. Density waves in the interstellar medium, its role in star formation, the giant planets, asteroids, and comets of the solar system are among the objects of investigation. The telescope has a Ritchey-Chretien configuration, with an aperture of 60 cm and an overall f-ratio of 15. The primary and secondary mirrors are made of fused silica. The field of view of the telescope is 20 arc-min and the pointing accuracy is 5 arc-s. The collected flux in the wavelength range of 2-120 micrometers is channeled to one of the four detecting instruments, as desired. The observatory contains two 750-l tanks of liquid hydrogen and liquid helium to cool the detectors. Science data will be obtained for ten hours during each orbit and telemetered in real-time, at a rate of 44 kbps. The operating lifetime of the observatory is 18 months. Family: Astronomy, High earth orbit, Infrared astronomy satellite. Country: Europe. Launch Vehicles: Ariane, Ariane 44P. Launch Sites: Kourou, Kourou ELA2. Agency: ESA. Bibliography: 2, 6, 11241, 12691. 1995 November 17 - . 01:20 GMT - . Launch Site: Kourou. Launch Complex: Kourou ELA2. LV Family: Ariane. Launch Vehicle: Ariane 44P. ISO - . Mass: 2,500 kg (5,500 lb). Nation: Europe. Agency: ESA. Class: Astronomy. 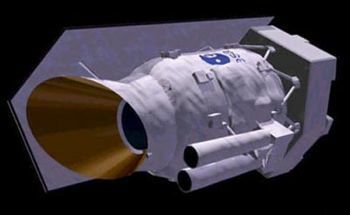 Type: X-ray astronomy satellite. Spacecraft: ISO. Completed Operations Date: 1998-05-16 . USAF Sat Cat: 23715 . COSPAR: 1995-062A. Apogee: 70,504 km (43,809 mi). Perigee: 1,110 km (680 mi). Inclination: 5.10 deg. Period: 1,417.80 min. Infrared Space Observatory; IR astrophysics. As of 6 September 2001 located at 168.62 deg E drifting at 5.004 deg E per day. As of 2007 Mar 6 located at 167.18W drifting at 5.668E degrees per day..